Hilary Duff: I’m a mermaid! Hilary Duff has dyed her hair green. The 27-year-old singer and actress is famous for her blonde locks. And despite previously experimenting with brunette hair, Hilary’s latest transformation is undoubtedly her most drastic. Hilary shared a picture of her new look on her Instagram page on Wednesday night. In the shot, Hilary is seen wearing a white top and ripped white jeans as she poses in front of the mirror. “@Ambahhh turned me into a mermaid last night … love all u girls,” Hilary captioned the picture. Hilary had her hair dyed at the Nine Zero One salon in West Hollywood by hairstylist Amber Maynard, who counts Demi Lovato and Helen Hunt among her most famous clients. 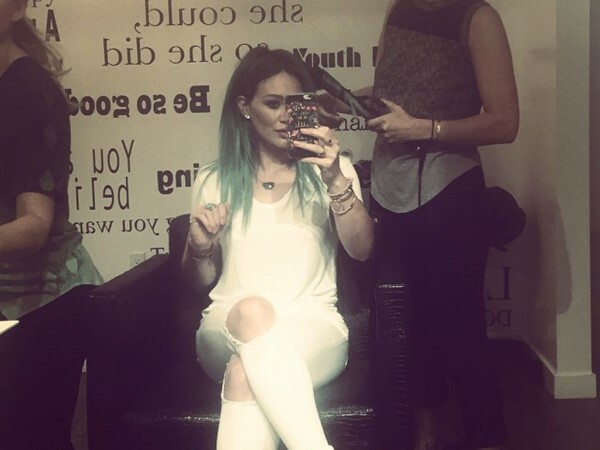 Hilary isn’t the only star to have tried out teal locks. Colour chameleon Katy Perry previously rocked the look, while Kylie Jenner also sported green-tinged locks until recently. Hilary’s new style comes after she filed for divorce from husband Mike Comrie earlier this month. Speaking about her split in a recent interview with America’s Cosmopolitan magazine, Hilary insisted that they are still on good terms despite rumours surrounding the end of their marriage.